PROGIRA® plan is an integral, radio-frequency engineering tool for planning truly cost-effective and spectrum-efficient network solutions. It enables users to achieve the best possible network coverage, with minimal infrastructure investments. Furthermore, features are embedded to resolve the issue of digital dividend. 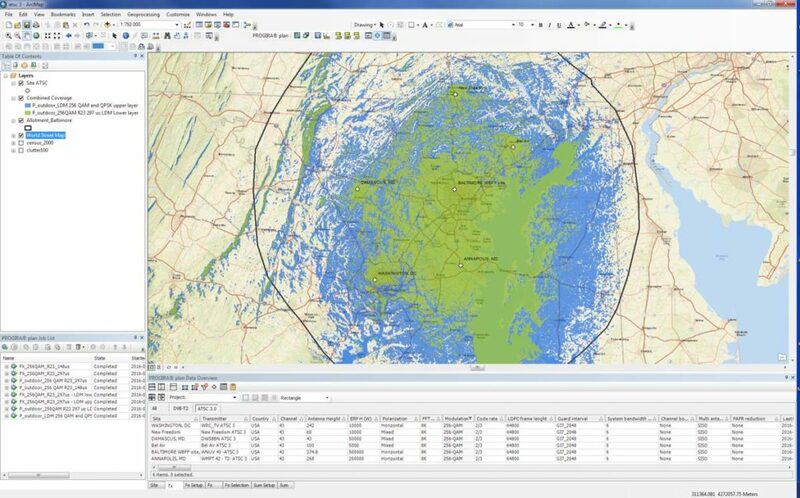 It utilizes the world-leading solution for digital cartography – Esri’s ArcGIS platform, keeping users ahead in their radio-frequency engineering projects with cutting-edge GIS capabilities. The current version is a release that brings a number of important new features, such as support for ATSC 3.0, improved tools and even better performance. 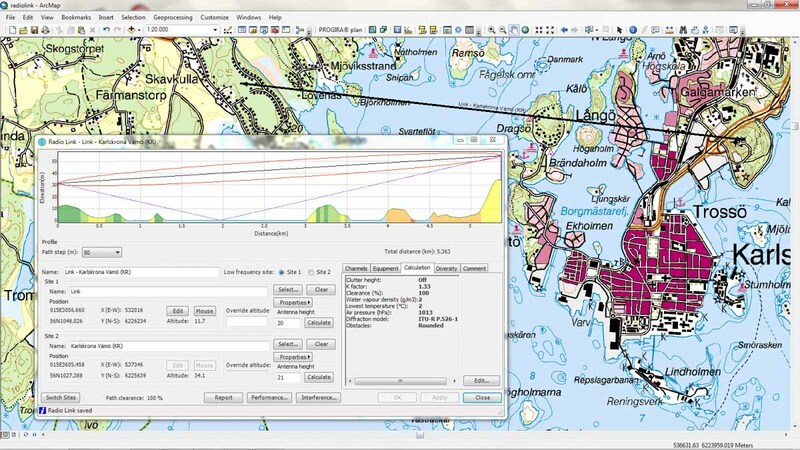 PROGIRA® plan is based on the ArcGIS platform by ESRI. The open ArcGIS platform makes it easy to integrate different map formats and to add new applications. The platform enables a holistic approach to your business by offering add-on modules and specific functionality for covering different business phases from market analysis, network planning, engineering and construction, to service and customer care. PROGIRA® plan Frequency Planning Module enables you to optimise your use of frequencies, making the most of a scarce resource. Whether you are a regulator planning for optimal use of spectrum, or an operator planning to roll-out a digital broadcasting network, PROGIRA® plan helps you coordinate and optimise the use of frequencies with maximum efficiency while complying with international regulations and bilateral agreements. 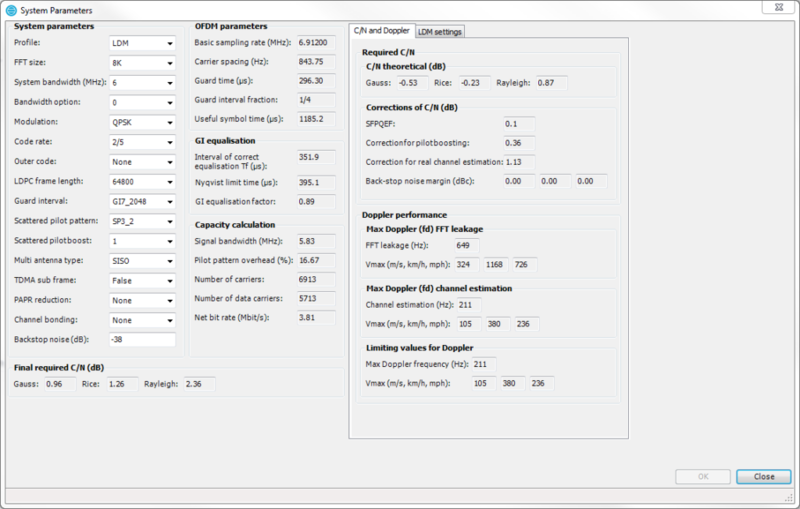 PROGIRA® plan Frequency Planning Module : Example of a calculation where the network implementation is not in conformity with the GE06 plan. Allotment/SFN editor enables creation of user defined allotment contours and linked SFN transmitters. Coordination contour calculates contour areas where transmitters, allotments, or GE06 plan entries generate a certain field strength level. Field strength on country borders calculations. ERP restrictions calculates the necessary power reductions that are needed in certain azimuths to reach a given field strength level on country, allotment, or user defined boundary points. Conformity check ensures that a network implementation conforms to the corresponding GE06 plan entry. Frequency scan enables optimization of the use of frequencies. Coverage contour calculates noise and interference limited coverage contour areas for a transmitter. ATSC 3.0, the new US television broadcast standard, is one example of the continuous evolution of PROGIRA® plan helping our clients to improve the value of their software. PROGIRA will closely follow the development of new broadcast systems and implement those in PROGIRA® plan as soon as they are standardized. ATSC 3.0 is similar to the other existing DTT standards, like for example DVB-T/T2, ISDB-T and DTMB (Chinese standard), all using multicarrier OFDM but contains more features. The possible modulation schemes available are QPSK, 16QAM, 64QAM, 256QAM, 1024QAM and 4096 QAM, using non uniform constellations. This makes it possible to provide robust services using low bitrate for mobile/portable receivers up to very high bitrates requiring a high C/N, aimed at rooftop reception. Bitrates range from 1.5 Mbit/s with a C/N of say -5 dB up to say 50 Mbit/s requiring a C/N of well above 30 dB (6 MHz), suitable for Ultra High Definition (UHD) transmissions. If the capacity provided in one RF channel is still not sufficient two RF channels can be combined to double the transmission capacity, so called channel bonding. Another example where more choices in system parameters is offered, is the number of allowed pilot patterns. While for example DVB-T2 has 8 different options ATSC 3.0 has 16 different options. This makes adaption of the service to special reception conditions easier. One very interesting new feature is also the inclusion of Layer Division Multiplexing (LDM) in baseline specification (mandatory). This makes it possible to broadcast two service layers, an upper and a lower layer. These two layers are transmitted with different robustness (modulation and code rate). The upper layers requiring a low C/N for mobile reception and a lower layer which is less robust, injected at a lower power level. In this way it is possible to efficiently combine mobile and rooftop reception services in the same transmission. PROGIRA® plan will handle all these possible system parameters which will make it easy for our clients to predict a certain network implementation before investing in the infrastructure. In order to meet the requests from our users PROGIRA has also developed planning support for ATSC 3.0. The ATSC module will also support use of SFN and LDM services with different robustness as well as support for frequency planning and coordination of ATSC 3.0 services within the existing regulatory framework. PROGIRA® plan Network Verification Module lets you present, analyse and compare field measurement data which can be imported from all measurement systems with text file export functionality. To limit the cost of network infrastructure operators prefer to build as few sites as possible without compromising signal quality in the service area. In digital broadcast networks, and especially when using SFN, it is critical to maintain high signal quality. During the network planning process the coverage is predicted using different propagation models. To verify the coverage and to fine-tune these predictions, measurement is needed. Prediction models may then be calibrated by comparing actual measurements with predicted field strength. 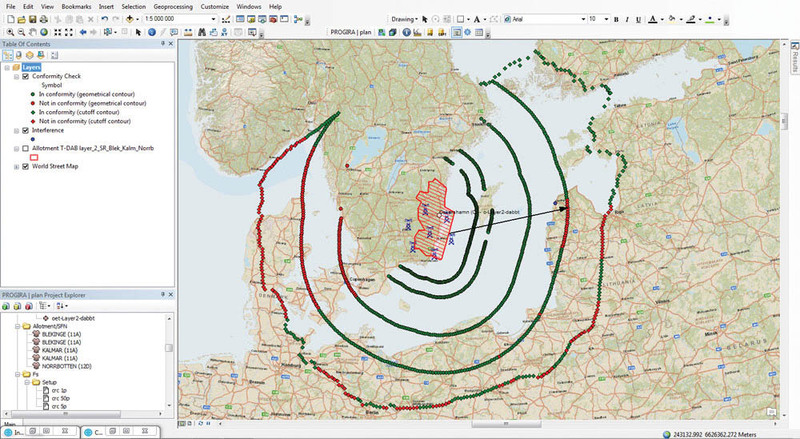 To support the transmission network planning between broadcast sites a Microwave Planning Module is available in PROGIRA® plan. The module offers path calculation including path clearance, ground reflections, interference and performance and availability calculations. The calculations are based on the latest ITU recommendations and a customizable equipment database for different radios, antennas and feeders. 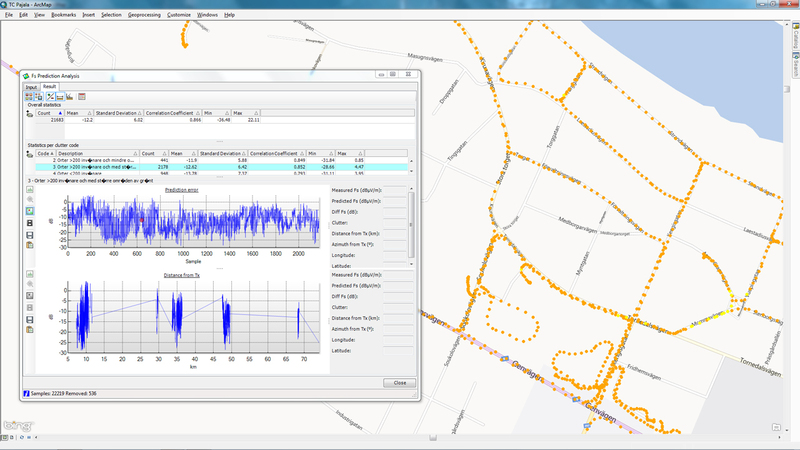 PROGIRA® plan Microwave Link Planning Module: Path performance and availability calculations. Path profile with clutter distribution. Path calculation for receiver input level. Ground reflection and path clearance calculation, including minimum antenna height needed. Path performance and availability calculations including attenuation according to latest ITU recommendations, e.g. ITU-R P.530, ITU-T G.821, ITU-T G.826, ITU-T G.828, ITU-R P.676, ITU-R P.837, ITU-R P.526. Frequency-, Space- or Combined diversity to improve performance and availability. Interference calculation between consecutive and cross radio links. Search for interfering radio links. ITU and user defined frequency plans. Equipment database for different radios, antennas and feeders. To schedule a web demonstration of PROGIRA® plan click below to contact us and we will arrange it for you. If you have questions or any trouble with PROGIRA® plan contact us directly at support@progira.com. 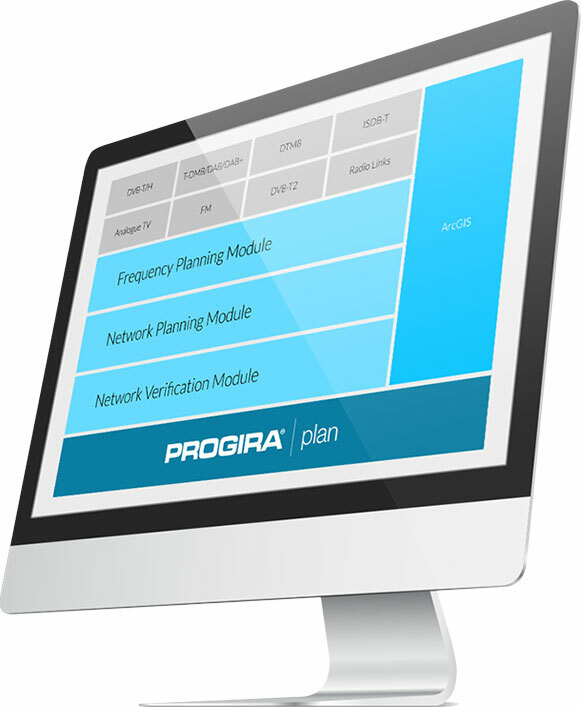 PROGIRA® plan is a module-based radio-frequency (RF) planning tool especially focused on solutions for broadcast and mobile TV networks. Applications range from Microwave links; to analogue TV, FM/Synchronous FM and AM; and on to digital broadcasting systems including DVB-T/T2, ISDB-T, ATSC 1.0, ATSC 3.0, DTMB, DTMB-A, CMMB, T-DAB/DAB+, T-DMB, DRM, and DRM+. PROGIRA® plan also includes specific functionality to resolve the Digital Dividend aspects of planning. The tools, which are based on internationally agreed planning norms and methods, can be used to present, analyze, and mitigate the impact wireless communication systems, such as LTE, will have on the existing digital terrestrial television networks when they are introduced on frequencies used for broadcasting. In addition, it features advanced database capabilities and handling of the ITU, FCC (US) and CEPT (Europe) data formats, as well as several prediction models including CRC-Predict, IRT 2D/3D, Longley-Rice, ITU-R P.1812, and ITU-R P.1546. PROGIRA® plan consists of a Base module and four function specific modules – Microwave Link Planning, Network Planning, Frequency Planning, and Network Verification. PROGIRA® plan uses ESRI ArcGIS, an open and widely used GIS platform that makes geographical presentations more userfriendly and eases the addition of new presentation formats and GIS applications. PROGIRA® plan incorporates decades of hands-on experience from our broadcast network planning craftsmen into every module, guaranteeing dependability and a work flow that ensures user friendliness. Continual development, managed by pioneers within digital broadcasting, ensures optimal solutions for everevolving needs and market requirements. The implementation of new standards and client-specific needs results in a continually enhanced product, benefiting from the experience of both our clients and our own craftsmen. The main benefits of PROGIRA® plan? PROGIRA® plan is a user-friendly planning tool with all the functionality you need for pre-study, planning and evaluation of RF networks. PROGIRA® plan incorporates efficient and reliable tools for achieving networks with the desired quality and availability, at minimal cost. Powered by ESRI’s ArcGIS, PROGIRA® plan handles all map data formats and features the most advanced GIS functionality in comparison with other radio network planning software. Improved and optimized for your day-to-day reality. Because we take support and user feedback very seriously, and consider each case carefully, we have been able to improve PROGIRA® plan in a very meaningful way. The most important — the most useful — features requested by, or identified together with our users, have been added to the software. And as trends and recommendations from standards organizations continue to evolve, so does PROGIRA® plan.